I encourage artists to learn and use the C-M-Y wheel, in which cyan stands in for what we’ve always known to be primary blue, and magenta fills in for red. However, use cyan and magenta in place of blue and red, and the mixing of these primaries creates a broader and more luminous range of colors than the traditional yellow-red-blue primaries of the artists’ wheel. It is difficult, if not impossible, to mix vibrant purples and red-violets using a true blue and red pigment. Because magenta is more luminous than red, using it as a primary rather than red greatly expands the red-pink-purple range. When I work directly with the wheel, I use a C-M-Y wheel, because I want that fuller range of colors. And I am particularly drawn to cyan and magenta and the colors they can create. When I look at the traditional artist’s wheel, I immediately sense the lack of luminosity and vibrancy, and find it leaves me visually unfulfilled. The wheel I use, a C-M-Y wheel (available for free with purchase, see left, or in the “Books, Patterns, & More” section, under “Bead Accessories”). 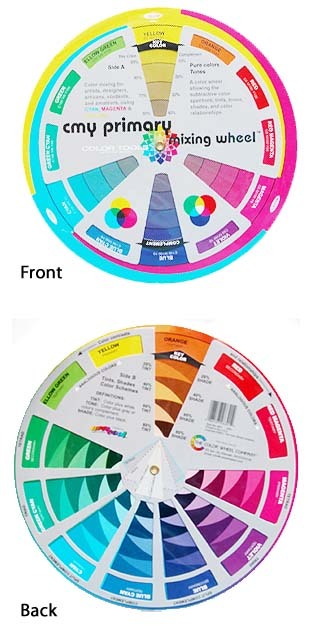 Also, the CMY wheel is more contemporary, accounting for the wide range of chemical dyes available to us. This is especially important to bead artists who work with a wide range of colors, yet cannot mix their colors as painters do. If you’re an artist working with a wide range of purples, pinks, teals and blue-greens, the colors of cyan and magenta are critical to your palette.